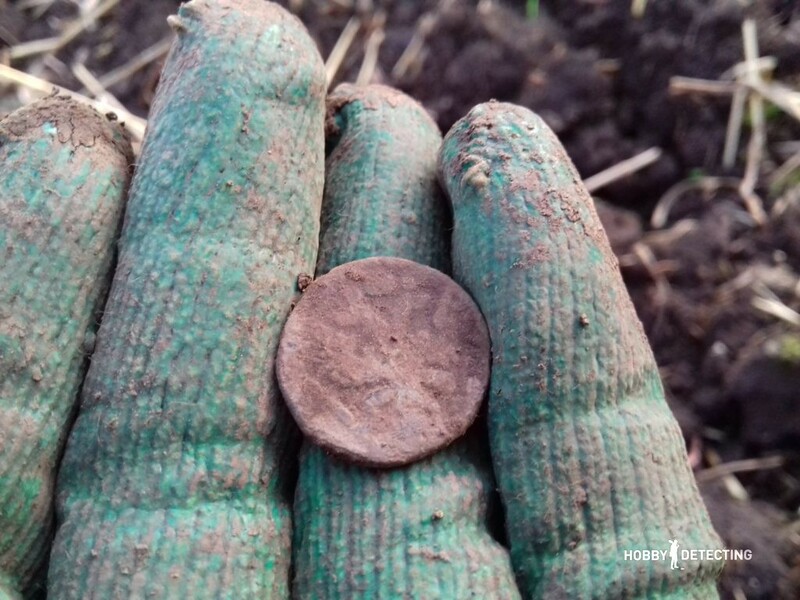 While the depressing autumn rain is already pounding on the window, it is a good time to tell about a recent detecting trip. 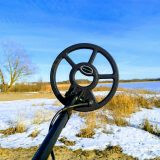 So, the place of this detecting was an abandoned area with broken roads and endless fields. There weer some outskirts of an ancient village there, and near to it, there once was a road through which the army of Ivan the Terrible went to take Kazan. 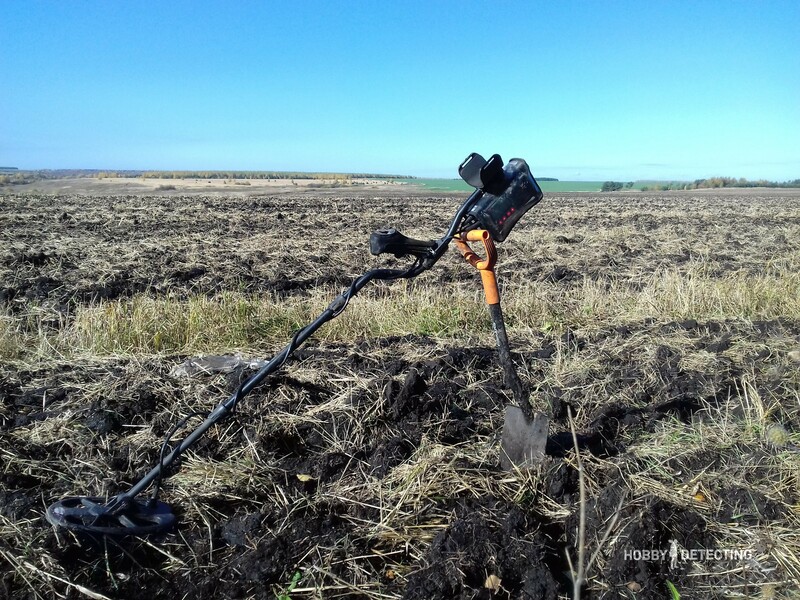 It was the beginning of October, the harvest was already collected and the fields were plowed, thus being the most favorable conditions for detecting. I arrived at a pre-planned place in the afternoon by car. Despite the rain, I unpacekd my detector, the Turkish Nocta Fors Relic, i put on a waterproof suit, took a shovel and went into the field. And then a surprise awaited me – the batteries didn’t proceed to live a long time. I forgot to take spare batteries. They lasted enough for me to detect several minutes walking on the field, but then when trying to set the ground balance the device turned off immediately. In general, you should never forget the rule – to bring spare batteries. Fortunately, a few kilometers away there was a district center, where I was able to buy new batteries. 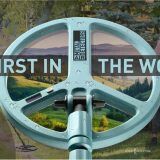 But much time was lost and as a result, on the first day it was impossible to dig. Plus everything quickly grew dark and I had nothing left, so I decided to spend the night right in the car. I threw the driver’s seat back, climbed into the sleeping bag and slept with the sleep of the righteous all night, while the rain drummed on the roof and the windows. 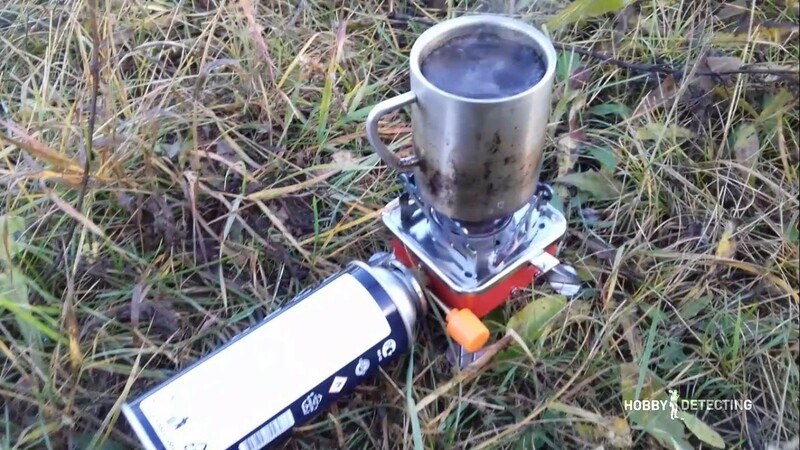 The next morning I cooked me some strong coffee on a gas stove and moved into the field. 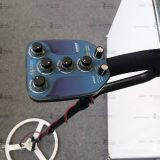 I adjusted the device to the DI2 mode, put the sensitivity on 85 and waited for a good signal. 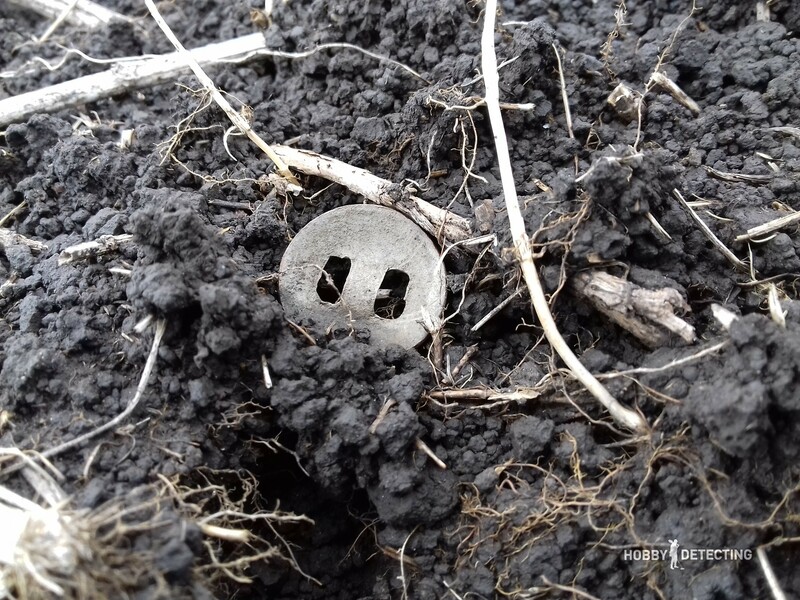 I was lucky, the field was almost not littered: no aluminum tubes ringing like coins and very few bottle caps, although there were quite a few different large iron objects. 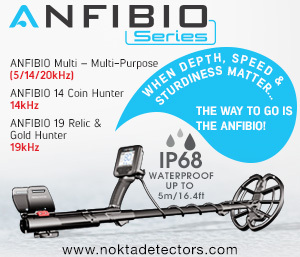 Fortunately, in the Nokta in DI2 mode, it can be recognized immediately by the sound. Soon the first coin appeared – a Soviet penny from 1961. 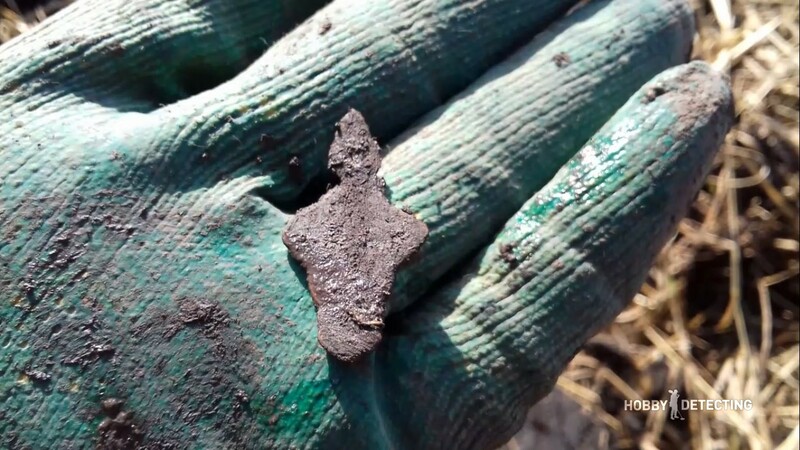 After another few minutes of searching i found a horse harness buckle. 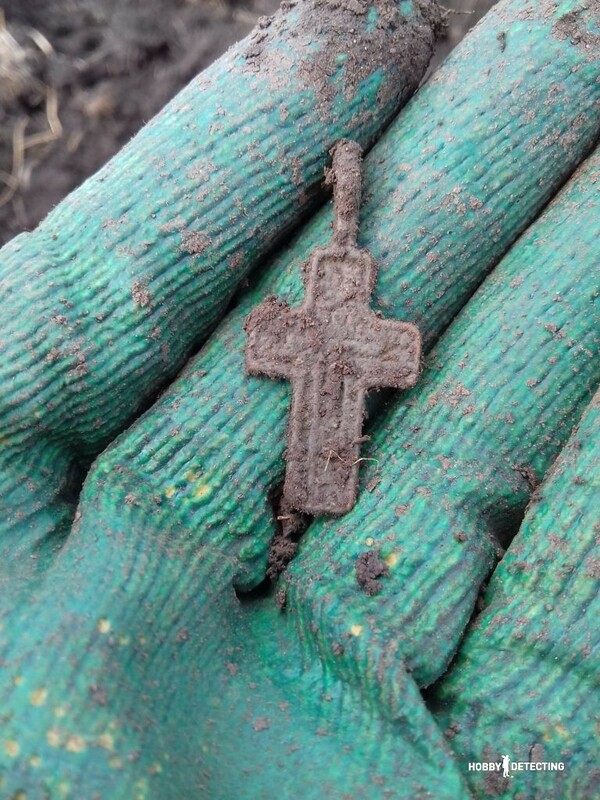 I stocked up with patience and after a while, finally, there was the first interesting find – an old copper cross. Such crosses were worn by Russian peasants in the 18th and 20th centuries. The find immediately added courage and lifted my mood. Then there was another horse harness buckle, which lay directly on the surface, and a rifle bullet after that. There was no war in these parts of the country, so it was difficult to say who could shoot and at whom. Finally, there was a copper button, but unfortunately without a pattern. The fatigue began to make itself felt, and it was necessary to take a break. After just a few hours of digging, a hot plate stew with rye bread seemed like a real delicacy. After dinner, I decided to change my location and moved to the plowed field on the other side of the village. 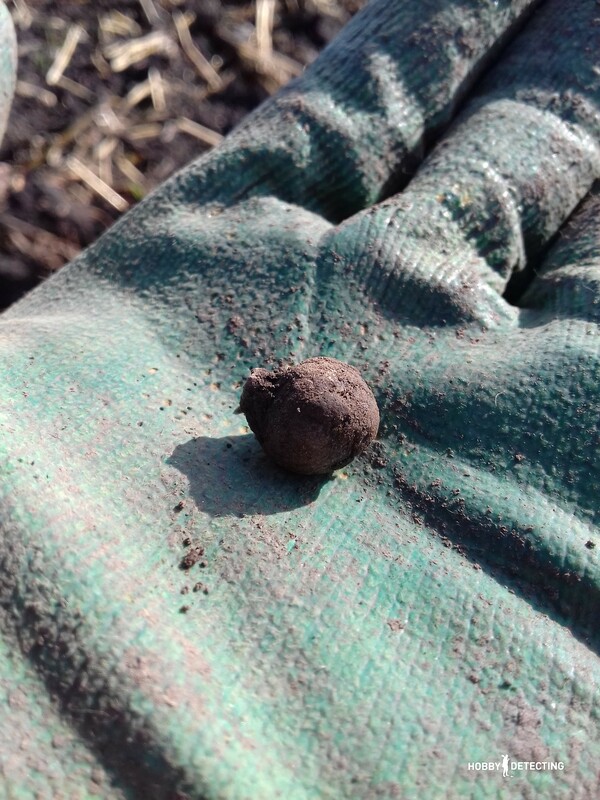 Here I soon got an old bullet, most likely from a pistol of the XVIII or XIX century. 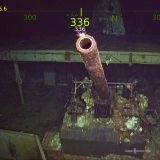 Perhaps it was lying in the ground since the Pugachev rebellion. This field was huge, you would never detect the whole thing, and for the next find I had to wait a long time. 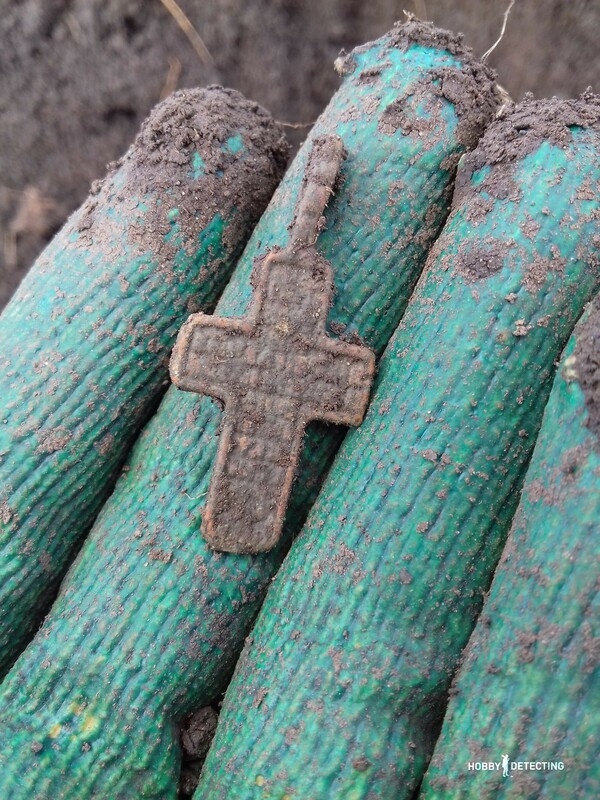 This find was another copper cross, this time stamped with an almost worn out pattern. The day was approaching the sunset and the sun was already almost hidden behind the horizon. 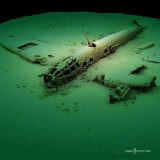 I began to move towards the car, complaining that for the whole day I had not found a single antique coin. And so, about ten meters from the car, I suddenly heard a good color signal. 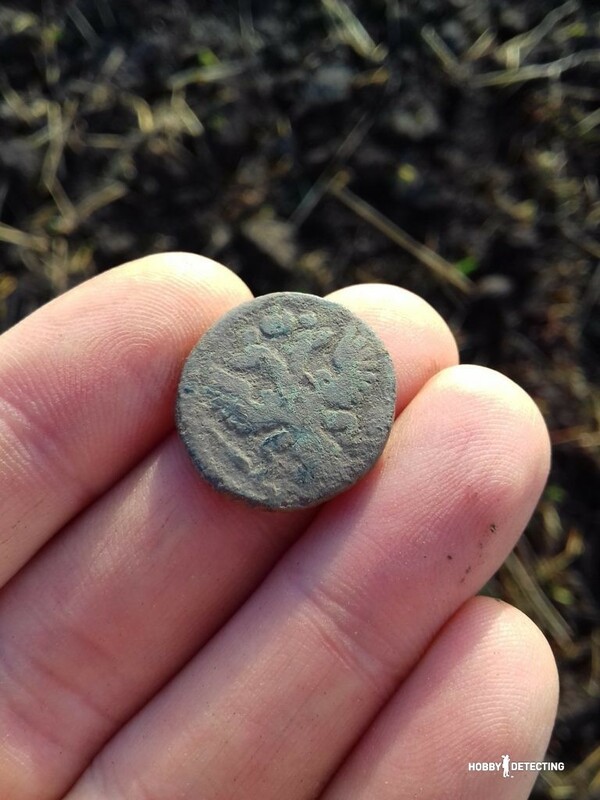 Digging up the ground with a shovel, I found a long-awaited copper coin with a double-headed eagle on the obverse! It immediately became clear that this was a “polushka”, as they are called. 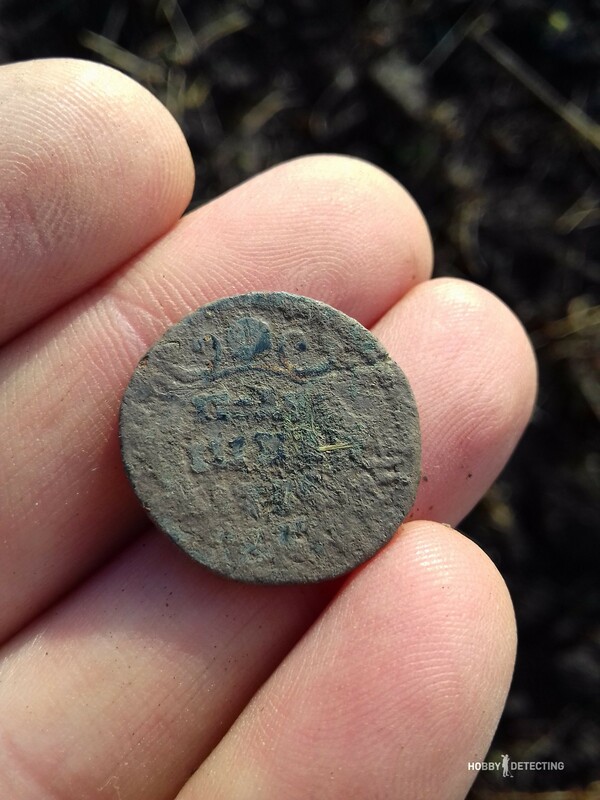 Unfortunately, it was in a horrible condition – after cleaning it turned out that the reverse of the coin is corroded so much that you can only see the first three digits of the year – 173… As much as I wanted to continue my detecting, it was slowly coming to an end and I had to return home. Even though my finds this time were not particularly valuable, I got excellent emotions from detecting, and that, you see, is not so little. Arriving home, I managed to read the year, it turned out to be 1734. 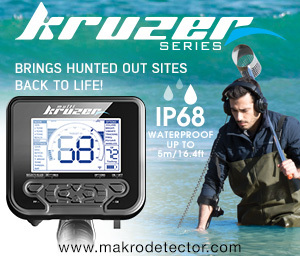 The main thing with detecting are not even the finds, but a well-spent time!